I haven’t been wandering the cool confines of a movie theater much this summer. Declining ticket sales can be explained by not wanting to spend the money and just not having much time, but more than anything? There hasn’t been much I’ve wanted to see. No preview that’s really tickled my fancy. But at the suggestion of my family, we trekked out to see “Begin Again” on Saturday. I didn’t know what to expect beyond Adam Levine being a bad boyfriend and Keira Knightley singing (?) and Mark Ruffalo being totally down on his luck . . . and maybe that’s why I was completely blown away? Because I was. I was blown away. It was actually . . . amazing. Knightley plays Gretta, a young musician who follows her boyfriend (Levine) and his own rising star to New York City. Nervously playing in a grungy bar the night before she’s set to flee home to England, she attracts the attention of a music executive whose recent antics have gotten him ousted from the indie label he founded. Hearing Gretta — even amidst the rude shouting and drunken chatter — reignites his desire to produce music that means something, and the two embark on a journey that changes everything. That’s the simple version. But it doesn’t tell you anything about how romantic, sweet, inspiring, thoughtful and beautifully shot it is; you need me for that, eh? “Begin Again” is about second chances, moving forward, thriving in the face of loss . . . and it’s just full of emotion, though not in a schmaltzy way. I’m not generally a huge fan of Keira Knightley — nothing personal, I mean, she’s just not a fave — but wow, color me impressed. And Adam Levine as a self-absorbed but loveable pop star? I totally bought it. I kid. But really, his acting? Singing? Ability to look gorgeous? Not bad. As you’d hope from a film about aspiring musicians and the ever-changing business itself, the tunes and soundtrack were fantastic. As we were leaving the theater, I told my sister how much it reminded me of the lovely “Once” . . . and then I started to Google and discovered it was directed by John Carney, who directed — you guessed it! — “Once.” (It’s, um, also on the poster, but I didn’t inspect that ahead of time.) Glen Hansard co-wrote a song, too. When I’m on, I’m on. The many layers of “Begin Again” are what made it work so spectacularly for me — and more than anything, it’s an homage to falling in love. With a person or a place (New York City, indeed), yes, but also a passion and a calling. The whole film is about passion, really, and it moved me. I can’t pinpoint another recent movie I’ve loved as much — so much that I’d run back out and see it again tomorrow. I’m pretty much in love with “Lost Stars,” one of the signature tracks, and have played it more than I’d care to admit to you before we’ve all had our coffee. That’s pretty much what I wanted to talk about today, mostly because I’m heading into one of the busiest work weeks of my year and my brain is pretty much guaranteed to be crispy like a fried-green tomato by Friday evening. I kind of want to just think about “Begin Again” like a fangirl, eat lots of marshmallows and hide under my desk, but I am 29 now. Guess I’d better go put on my sensible work heels and hustle. Or maybe I’ll keep watching the video instead. Taking a break from my regularly-scheduled Wednesday photo posts to talk Gatsby. Honestly, can one have too much Gatsby in their life? I doubt it, old sport. Like so many teens, my first exposure to F. Scott Fitzgerald’s classic came in high school. The Great Gatsby was assigned reading my sophomore year — and though I’ve always been a reader, it took an introduction to this work to get me excited about literature. Gatsby was a gateway drug. I sprang to Austen and Dickens after this 1925 classic, devouring Shakespeare and Welty in turn. Heck, I even humored Hemingway. I was addicted. Because Gatsby is accessible, entertaining, absorbing and all-around fantastic, I didn’t spend my time as a student afraid to approach Great Literature. I wasn’t scared off by serious tones and symbolism. The Canon of Fabulous Works didn’t intimidate me. My obsession with reading launched my English studies in college, which sharpened my writing skills, which led to my career as a writer and editor. Can I thank Gatsby for that? But as a lovesick teen girl, I wasn’t focused on the corruption of the American dream or costs of decadence. At 15, I became enamored with the Jazz Age classic because I considered it a love story. (And maybe it still is.) Gatsby’s pursuit of Daisy seemed unrelentingly optimistic and just . . . sweet. Ignorant to the book’s messages, I read it purely as the story of a man who could never forget his first love. Convinced he need only money and luxury to lure Daisy away from the privileged, “careless” life she shares with Tom Buchanan, Gatsby sets off to make it big. And win Daisy back. Her green light is a beacon of hope — one that declares he can have anything he’s ever wished for . . . if he never eases up. It’s interesting now, examining the story as an adult. I’ve read the book three times and am halfway through a fourth. We went to see Baz Luhrmann’s latest film adaptation on Sunday . . . and I became obsessed with the story anew. No matter how many times I hold Gatsby up for inspection, analyzing his motives and means and parts, I can still uncover more layers. Almost a century after it landed in the hands of its first readers, we still have so much to talk about. I loved the film. I loved it so hard. Leonardo DiCaprio was a charismatic, convincing Gatsby, and I viewed his pursuit of wealth and the so-called American Dream with fresh eyes. Daisy’s portrayal by Carey Mulligan was the perfect mix of disaffected ingenue and fragile mess, which I adored, and I despised her all over again. And can we talk about the music? I know people are all over the place with this one. Executive produced by Jay-Z, the film’s soundtrack features eclectic music — hip-hop, alternative rock — and modern tunes punctuate some of the movie’s most pivotal scenes. As Gatsby and Nick fly in that iconic car and the New York skyline comes into view, a haunting bar of Alicia Key’s “Empire State of Mind” caught me off-guard. But I liked it. It took what could have been a staid interpretation of an iconic story and turned it around. I downloaded Lana Del Rey’s “Young and Beautiful” from bed the next morning. I just . . . couldn’t get it out of my head. It’s so haunting. The whole film is haunting. The modern feel isn’t for everyone, I know. And that’s okay. But even the departures from Fitzgerald’s text — notably a framework where Nick is telling Gatsby’s story from a sanitarium, where he’s being treated for alcoholism and depression, among other ailments — just added to the narrative; for me, it didn’t take anything away. I like that Gatsby is still provoking us to imagine things differently, to ask questions and draw the text into the current world. Did I think the movie was flawless? No. Nothing ever is. But I didn’t go into “The Great Gatsby” wearing my critical glasses. I wanted to be transported, entertained and dazzled — exactly what I’d expect from a Luhrmann film. And I was. As the credits rolled and the lights came up, I blinked in the dim light. I felt disoriented. Even knowing precisely what was going to happen didn’t save me from feeling breathless throughout the movie, and somehow still shocked by its close. I wanted things to be different. When I got home on Sunday, I dug through my bookshelves until I found my tattered old copy of Gatsby. It’s underlined and highlighted, dog-eared on pages where a passage or two struck me, and worn around the edges from getting stuffed into book bags and purses. I’m 100 pages into my latest reading. Despite being such a relentless lover of literature, I never re-read books. Ever. Seriously, Gatsby is the only book I’ve ever read more than once — and being on a fourth reading is sort of ludicrous. But seeing the film provoked so many new questions . . . and I wanted to be able to compare the film and book after a fresh reading of the text. But I can’t really do that. Not really. It’s not fair to intricately compare a book to its cinematic counterpart; they’re two different ways of storytelling. Overall, would I declare the film “faithful” to the beloved text? Yes, I would. And if I agree with some of the quibbles about Nick’s role, for instance, that doesn’t dampen my overall enthusiasm. Gatsby moves me like no other story, and “Gatsby” on the big screen was an incredible experience. I loved it. And if you love the story, too, I trust you’ve got your tickets. 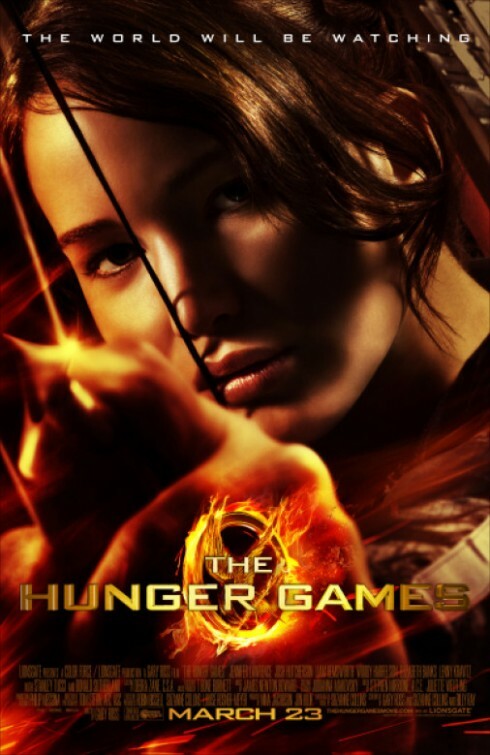 So I finally saw ‘The Hunger Games’ . . .
. . . And it was awesome. Even with my love of the series, I’m not one to debate all the similarities and differences. I recognize that adapting a book to a film is an extremely difficult process, and it would be impossible for movies to completely echo their literary counterparts. What works in print can’t always work in film. 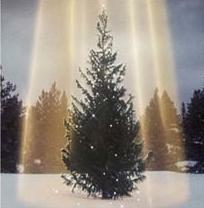 Other ways must be discovered to convey certain messages, certain ideas. That being said, I thought they were darn close. And close in all the ways that mattered. I’m going to be honest: as I was reading, I was always Team Gale; he was the strong, silent type, and maybe I just tend to like brunettes. Peeta seemed weak and dull. The baker’s son? Even after the bread-throwing act of mercy, I wasn’t really endeared to him. But I couldn’t help but be swept up in their story, constantly asking myself a central question of the series: does Katniss really fall for Peeta? Or is it all a game? When the final credits began to roll, my sister began to ask questions. My dad asked to borrow the second book, wanting to continue the story, and I spent dinner discussing the Suzanne Collins’ Panem and world-building, plus where the plot was headed in as spoiler-free a way as possible. They did. I thought that was very well done — from the futuristic music laid over scenes of the Capitol’s silly residents to the Dust Bowl-like grittiness of District 12 in present-day Appalachia. You definitely got the sense that people were starving while others were fat and happy, blowing their wealth on lush “costumes” and crazy makeup. 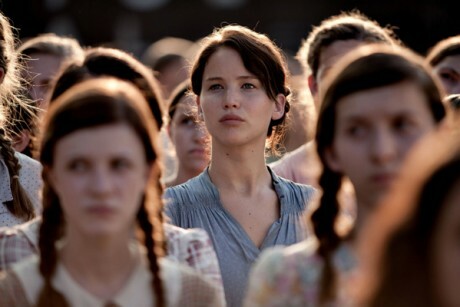 Others, like Katniss, were just trying to survive. Considering I read The Hunger Games two and a half years ago, I was shocked at how easily the details came flooding back. It was heartbreaking to see Katniss and Rue’s bond, and haunting to hear the melody carried by mockingjays through the woods. Though I knew how it would all play out, I was literally on the edge of my seat — or covering my face with one hand, peaking through the slats of my fingers during some of the difficult scenes. After we got up to go, my sister spoke first. “That was one of the most intense things I’ve ever seen,” she murmured, wide-eyed. And I agree. There’s a reason this series — and, now, the film — is so successful: it’s a poignant, horrifying story that can’t help but make you sit back and think, This could actually happen. “Kids killing kids,” my sister whispered at one point. “This is sick.” And it is. 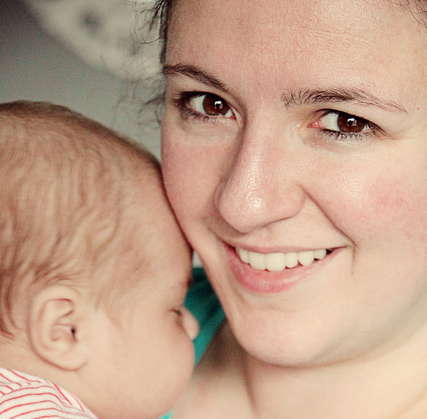 Horrible, ridiculous — actions so shocking that you can’t help but think, Really? This is entertainment? It’s more than that, of course. It’s punishment, too. But it makes you think. And know what else I’ll never be able to part with each holiday season, despite the fact that I’ve now seen it an estimated 1,284,468 times? A movie so ingrained in my holiday rituals, I’ve memorized almost every comedic moment — and frequently quote it to my family and friends? A film that has become An Institution In the Meg Household — capitalized letters, if you please — but one my dad now refuses to watch, because he’s just so darn sick of it? 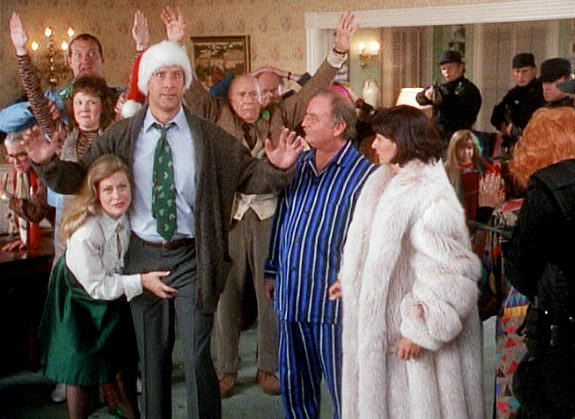 Yes, friends, I speak of “National Lampoon’s Christmas Vacation,” that gem of a film starring Chevy Chase and Beverly D’Angelo that is sure to bring tears (of laughter) to the eyes of all who view it. Released in 1989, our copy is on VHS — videotapes, whoa . . . remember those? — and is greatly weathered with age. Still, we pull it out every year and gather around with our hot chocolate, coffee and grins, ready to enjoy the magic all over again. It’s recently come to my attention that my sister’s boyfriend Eric has never seen this movie. I swear, a cold shiver ran through my entire body. How have you lived 23 years on this planet of ours and never watched “Christmas Vacation”? It’s blasphemy. It’s ridiculous. And I feel as though I am personally responsible for remedying this Terrible, Terrible Situation. Our annual viewing of this holiday classic has not yet taken place, but it’s only December 3 — I have plenty of time in which to torture — er, entertain — Eric with my favorite scenes, complete with voices and dramatic reenactments (I was president of the Thespian Troupe in high school, so don’t think I’m playing around). Until then, I’d like to provide a sample of what’s to come . . . a round of pre-Christmas dinner appetizers, if you will. All quotes taken from IMDB or my brain, as the case may be. 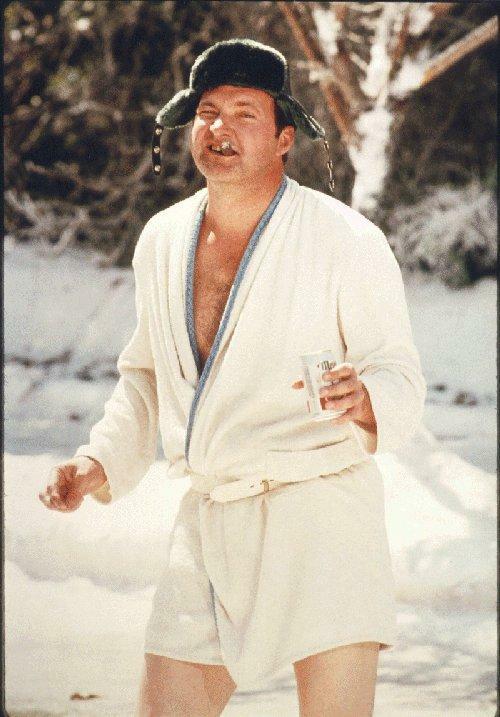 Cousin Eddie: You surprised to see us, Clark? Clark: Oh, Eddie… If I woke up tomorrow with my head sewn to the carpet, I wouldn’t be more surprised than I am now. Ellen: Oh, Aunt Bethany — you shouldn’t have done that. 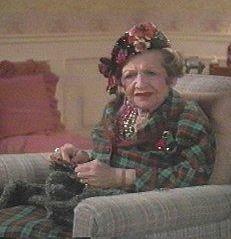 Aunt Bethany: Oh dear, did I break wind? Uncle Lewis: Jesus, did the room clear out, Bethany? Hell no, she means presents. You shouldn’t have brought presents. Uncle Lewis: Hey Gris, if you’re not doing anything constructive, run into the living room and get my stogey. Clark: Is there anything else I can do for you, Uncle Lewis? Ellen: He’s an old man. This may be his last Christmas. Clark: If he keeps it up, it WILL be his last Christmas. Aunt Bethany: What’s that sound? You hear it? It’s a funny squeaky sound. Uncle Lewis: You couldn’t hear a dump truck driving through a nitroglycerin plant. Ellen: Clark! I don’t want to spend the holidays dead! Art: [to Rocky] You got a kiss for me? Eddie: Better take a rain check on that, Art — he’s got a lip fungus they ain’t identified yet! Todd: [trying to fix a busted stereo] Obviously something had to break the window, something had to break the stereo. Margo: And why is the carpet all wet, Todd?! Todd: I don’t KNOW, Margo! Eddie: She falls down a well, her eyes go cross. She gets kicked by a mule, they go back. [laughs] I don’t know! Audrey: Do you sleep with your brother? Do you know how sick and twisted that is? Ellen: Well, I’m sleeping with your father. Don’t be so dramatic. Audrey: I hope nobody I know drives by and sees me standing in the yard staring at the house in my pajamas. Art: If they know your dad, they won’t think anything of it. So after devouring all four books in Stephenie Meyer’s Twilight series two summers ago and having quite the Edward Cullen-obsessed weekend this time last year, I figured “New Moon” would produce plenty more for me to gawk and cry and pant over this year. Yeah, and I was totally right. Because though I still pledge my loyalty to Edward for all his awkward, well-meaning devotion to Bella, Jacob Black? Dude stepped up to the plate. And became really, really ridiculously good looking. No one needs a summary of the film, so I’ll skip all that nonsense and get to the good stuff: “New Moon” was well acted, gorgeous to watch and, most importantly, way more entertaining than the actual novel! Of all the book in the series, New Moon was the most painful for me to get through . . . maybe because I’ve had my heart broken, too, but probably more because it was droning and long. I felt your pain, Bella, for reals, but at some point you have to pick yourself up, stop diving off cliffs and just get on with your life. But the Bella in this “New Moon”? Sassier. Still codependent and clearly unhealthily obsessed with Edward, for sure, but just . . . better. Kristen Stewart didn’t irk my last nerve nearly the way she did in “Twilight,” when I’d just about wanted to pop out of my seat in the theater and punch her rapidly blinking, constantly stuttering face. I was sincerely worried that the lack of Edward in the movie would leave me bored to tears, because that’s just about what happened while reading the book. Every few pages or so, I’d start skimming frantically ahead to see when our undead lover boy was going to emerge on the scene — or if he was going to come back. Because as much as Bella loved and missed him, desperately wanted to see him? I was just as anxious — and couldn’t take much more of her misery or toying with Jake’s emotions. My sister, Mom and I went to the 9:45 a.m. showing at our local theater — a time I thought (very, very naively) would be deserted. I mean, who goes to the movies before 10 a.m. on a weekend? Why do they even have movies before 10 a.m. on a weekend? Well, we showed up twenty minutes before the film started and still scrambled to find seats. Make a note on your mental scorecard ’cause it doesn’t happen often, but I was wrong. Plenty of husbands, fathers and boyfriends were around, and let me say this: are you ladies feeling all right? The very last place I would want my significant other to hang out with me is at movie where Robert Pattinson and Taylor Lautner remain shirtless for extended periods of time! Grown women in our theater gasped when Taylor first stripped off his T-shirt. Adult women. And how am I supposed to enjoy all the delicious eye candy while holding some other guy’s hand, his eyes analyzing mine to see if I’m really buying into all this romantic stuff (hint: I am)? Dude, you’re no Edward. Just go home and watch a football game or something. I don’t need your constant sarcastic comments in my ear, totally ruining my serious reverie and reminding me that the likelihood I’ll meet someone as kind, perfect, intelligent and devoted to me as one of these fictional characters is, um, zero. 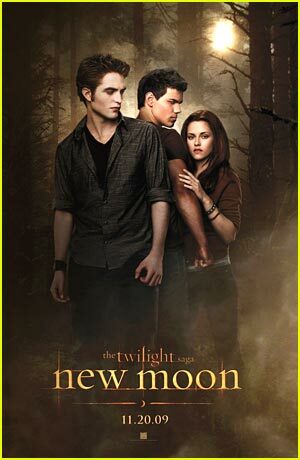 So all in all, “New Moon” was an epic win in my book! Plenty of action, suspense, romantic tension, family dynamics, cool scenery, bad guys (and girls), scenes in the Italian countryside . . . fantastic. My only gripe? The whole experience has left me with a serious tender spot for one Jacob Black, a character I’d never really paid any mind in the past. I’m still on Team Edward, but I can’t promise my alliance won’t shift if more images like the one above keep infiltrating my computer. And, you know, Jacob’s not all brooding and stalkery — unlike my boy Edward. Though I’ll keep running with the vampires . . . for now. Every now and then you come across a film that sends little jolts of electricity through your body, making the tiny hairs on your arm stand up and your lips to part and your eyes to dialate. You see a movie that lifts you out of a sticky reclining seat and into the ether, where you’re looking at a screen for an hour and a half but it feels like thirty seconds. “Garden State” was that kind of movie — a film that made me breathless after seeing it, desperate to grab the soundtrack and relive a little bit of what had me so transfixed. And now I can say, unequivocally, that “500 Days Of Summer” is all of that — and more. The movie’s tagline explains, “This is not a love story. This is a story about love.” And the players in our story about love? Tom, an L.A.-based greeting card writer and artist, and Summer, a woman who arrives from Michigan and promptly carries Tom’s belief about destiny around in her hairbow-laden ponytail. Tom is utterly captivated by her — by her laugh, her smile, her eyes, her teeth. He’s smitten. And the film is a chronicle of his love for her . . . and his eventual return to himself. Because this is, after all, Tom’s story of returning to the land of the living — shedding his ambivalence and complacency, opening his eyes to the world and recognizing that he has something major to contribute to it. Of course, it’s also a heartbreakingly realistic look at falling in love — the way in which the object of one’s desire consumes their thoughts, plans, energy. Joseph Gordon-Levitt is masterful as Tom — totally expressionate, moving, real. Zooey Deschanel’s Summer is ethereal, funny, beautiful . . . and, in many ways, unattainable. This doesn’t detract from Tom’s feelings of her, which are etched across his face in every scene. And, as my sister and I frequently whispered to each other, “He’s like the perfect guy.” And one seriously fantastic dresser. Though Tom is certainly an adult, this is ultimately a coming-of-age story. It’s a before and after. It’s a fantastic, goosebump-raising look at love, loss and having the courage to be vulnerable, open and honest in a world of, well, e-mail, text messages and greeting-card sentiments doing the hard stuff for us. It’s too hard for me to say succinctly why I felt like someone had reached into my chest, wrapped their fingers around my heart and started pulling — but that’s just what happened. I spent most of the film with my head bent toward my sister, tears welling in my eyes, and I couldn’t have lost more track of time if I tried. When the credits started to roll and the music swelled, I felt like I’d been on a trip to Pluto and just been dropped back to Earth. I guess I’ve just been there. And the fact that a team of writers, actors, producers and a director could make a film that feels as though my own heart has been laid bare is no small feat. I’ll be thinking about this one for a long time to come . . . and rushing home to download the soundtrack tonight!